Enhancement of data transfer safety level and the growth of the SSL technology is due to the increasing number of online transactions. Daily used, the SSL protocole is totally transparent and works without any manipulation from the webuser. What is it ? How does it work ? 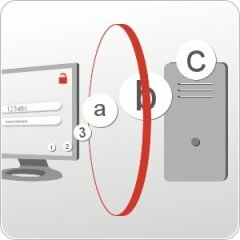 What's a digital certificate ? Developed by Netscape, the SSL (Secure Socket Layer) or TLS (Transport Layer Security), is a protocole used to secure online transactions. The SSL protocole creates a communication channel between a client and a server independently from the protocole, it secures online transactions (HTTP protocole) as well as FTP, IMAP or POP protocoles connexions. That communication channel is an opaque tunnel that prevents anybody to see the content of the transaction. Non-secured tranfer, no SSL certificate: A see-through communication tunnel, information can be seen by anybody. The private key is saved on the server. The public key, known by anybody encrypts sending datas, that are decoded on the server by the private key. A SSL certificate is a digital ID whose goal is to identify the owner of a server, a website or an Email address. It is issued by a trusted third part called a certification authority,such as Thawte,that testifies the certificate's owner identity. To make the SSL security work (for online transactions for example) a server certificate is required. When surfing, a webuser can see information about websites on the address bar. No information about the identity of the website's owner.The website does not carry any certificate. situated between non-secured websites and EV certificates. It gathers 1-factor certificates (aka domain-validated : low safety level, there's encipherment but the website owner's not known), 2-factor (domain and organization validated) and 3-factor (domain, organization and physical existence validated). High safety level provided by an EV certificate (extended validation). All the information about the website's owner are known. The connexion between the client and the server is entirely encrypted. The green bar is displayed. The website's certificate is disabled or contains false information. Appears on websites registered on your browser's known dangerous websites list.The access of the website is submited to your full acceptance. A Wildcard certificate can secure several subdomain names (such as:*.domain.com). It works the same way than a classical server certificate and carries the same kind of information. Instead of displaying a classical domain name,it contains a generic web address : *.domain.com.The star is instinctively replaced by the browser that searches if a certificate has been issued for the subdomain. 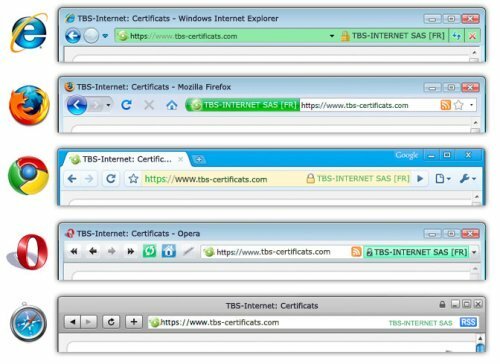 The multiple sites technology enables several websites,hosted on a same server, to be secured by one certificate. It prevents websites owners to purchasing a different certificate for each one of their sites. That kind of certificate is issued by GlobalSign.You can secure 6 SANs (Subject Alternative Names) with the GlobalSign UCC.